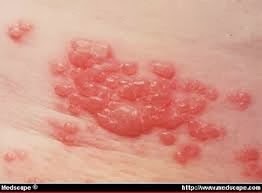 The shingles rash can be a distinctive cluster of fluid filled blisters often in a band around one side of the waist. This explains the term "shingles," which comes from the Latin word for belt. 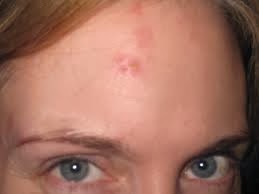 The next most common location is on one side of the forehead or around one eye. But shingles blisters can occur anywhere on the body. Shingles rash start as tiny blisters on a red base, with fresh blisters that continue to form for up to three to five days. The blisters follow the trail of individual nerves that come out of the spinal cord in a precise 'ray-like' allocation and become visible in a band-like pattern on an area of skin. 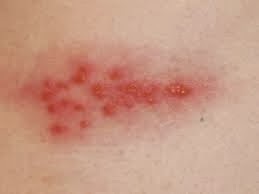 A shingles rash is characterised by pain and a rash. 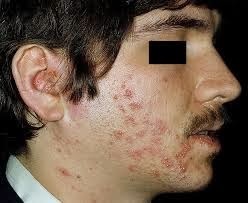 It is a condition where the skin develops painful rashes which turn into blisters that contain fluid in them. 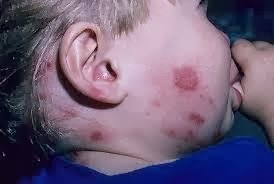 It is not easily transmitted, but it is developed by the body as the dormant chickenpox virus reactivates and goes from the body's nerves to the skin. Shingles can cause fairly dramatic pain which is followed within a few days by a rash. 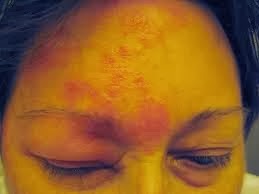 It usually appears in a particular location on one side of the body. The rash burns intensely, itches & is made up blisters that open up & crust over. A person could also have a fever, chills, headache and generalized aches & pains with fatigue.